This training cycle has left me with a host of aches and pains (though thankfully I am currently feel 99% perfect!). Recently my chiropractor told me to start stretching my hip flexors in order to decrease the tightness and achiness in my right hamstring. I thought, "huh?!" but like a good little patient, I went home and started doing the stretches every day. I mean at least five times a week. Instead of a chair, I put my back foot up on to a wall. Hold the pose for two minutes per side and do it every day! The crazy part? It has helped tremendously! My hamstring has felt great on my last few runs, including my last long run at Cougar on Saturday. Before my Saturday run I volunteered at the Cougar Mountain Trail Run Series race. One of my goals has been to give back a little more to the running community and trails that I love so much. 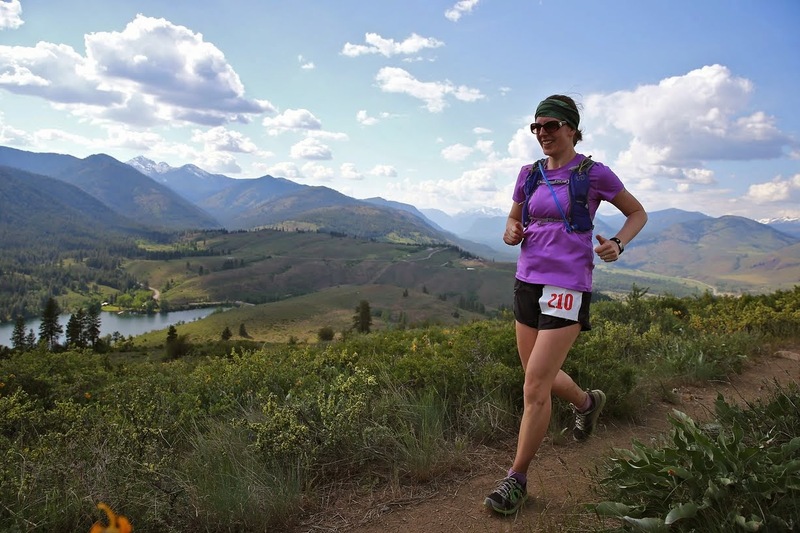 This particular trail run series donates a huge amount of money to King County Parks and Recreation, so volunteering helps the runners have a great race, and the more runners that register, the more money the parks (including Cougar!) get! Win-win. It was a beautiful day to hang out on the trails with some other wonderful folks cheering on the racers and making sure they were fueled, hydrated, and headed in the right direction. Everyone was out on the course, from young to old, from super speedy to out for a stroll. When the volunteer shift ended my friend and I ran the last two miles of the five mile course back to the start/finish area, then headed out to run the entire five mile course. It was a perfect run! My last "long" run before the 50k, eek! Funny how seven miles feels like nothing these days. All in perspective! 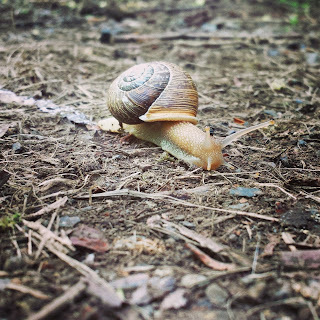 I have a good eye for slugs on the trail, but this is the first snail I have spotted! This time I realized the trick to photographing them is to rest my phone on the ground to help my camera focus a bit better. Looking forward to doing more volunteering/running for this race series in the future. 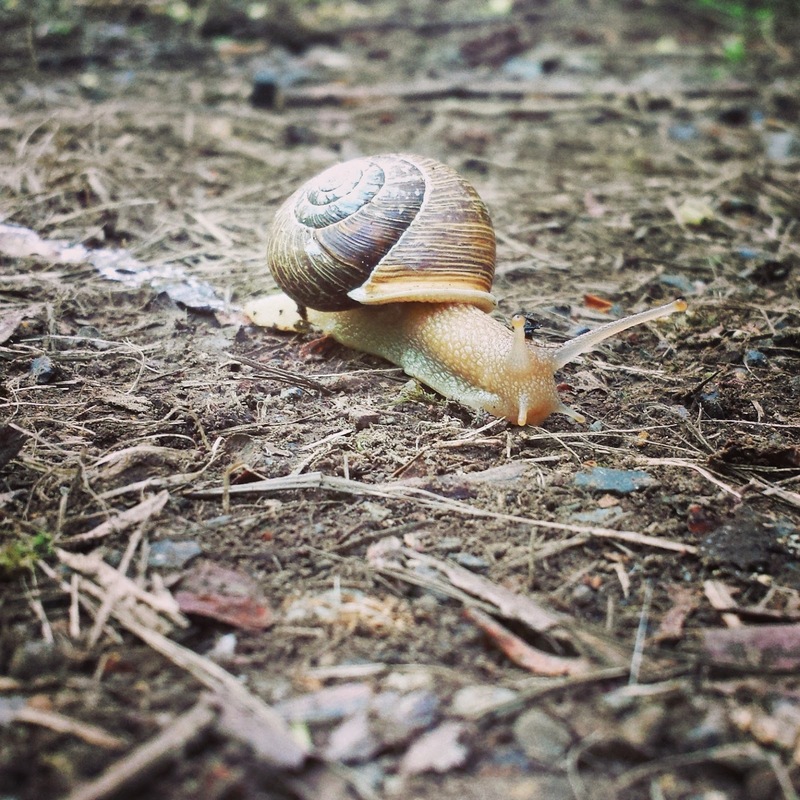 Be sure to check out the Cougar Mountain Trail Run Series if you are looking to either test your speed on the trails or just get out there and enjoy the day. I promise to cheer for you from the aid station!